I used to own a cheap chinese version of the Tennant suit. A friend told me about Magnoli's site, so I went here to have a look about. 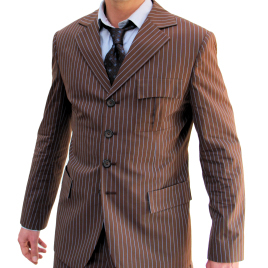 I was quite frankly amazed with all the highly detailed clothes he had for sale, and naturally, the Tennant suit. This suit is probably the most expensive piece of clothing I have. However, this is also some of the best clothing I now own. I can not stop looking at it, the accuracy to the one used in the show is just stunning! I do not regret buying this at all. Absolutely fantastic piece of craftmanship! Magnoli is one of the most talented artists (yes! This is art!) around, and I have not bought from him for the last time.